It’s is easy to reproduce, no audio (except the metronome) needed. (Use 2 PART’s). Just follow the progression with your eyes. You will see the down/first beat of the bar start to become out of Sync. Tested Egoist with 2 other hosts without issue. I only just re-downloaded Egoist yesterday, first time trying it as an AUv3. This may not be exclusive to Egoist, so quickly making you aware. I’m still yet to do a thread for ReSlice.. Cheers King. Rest assured, development (fancy term for Matt) will pick it up and fix it, if it’s of course an NS2 specific problem. I just tried this in Cubasis but it seems to work the same as NanoStudio - Egoist tracks the tempo OK, but doesn't attempt to sync the beat. Egoist's cursor always just marches on and never steps its position when the song position is changed. Am I being thick? Approaching it from a different direction, are there other AUs which do successfully sync both tempo and beat when hosted in NanoStudio? @King what are the two other host you tested this in that were successful? ... I'm currently eyeing up a suspicious line of code which definitely would have something to do with downbeat syncing. I'll have a bash at modifying that first and maybe it will have an effect on this issue too. Or it could be the dreaded double bug - one of mine and one in Egoist too. Cheers All, for looking into this. Haven’t tried other AU's for Sync testing in NanoStudio. AUM (of course) ... and ... dare I say it.. BM3! They both play Egoist perfectly! P.S; the main reason for the ‘visua’l explanation, was so all could experience/experiment. Playing audio is obviously where the issues is fully noticeable. Hmm, so one person seems to have it working in BM3 and the other doesn't. OK, I'll first have a go at fixing the bit which looks suspicious and if that fails then I suggest we simply go down the route of trolling each other and maybe some insult slinging too. If one of those solutions doesn't work then we can't say we haven't tried. Sounds like plan, good trolling is never bad. @dendy, crazy because Egoist on my old iPad 4 worked flawlessly. I guess it must be that I was running it without being a plug-in? yes, standalone version is relative ok..
I’m slightly spoilt here now. This is a 10.5” iPad Pro which I got for silly cheap money. Theoretically, anything should work! But notice that four letter word... 'work'... All this power, and I’m still tapping away on online forums! But the fonts are so big! I can change the size of the fonts. Anyway, for an old fart like me, this is a good thing, without having to pull out by specs. I've made some changes to the area where NanoStudio passes beat info to Audio Units. These changes looked promising to me but they seem to have had no effect on Egoist's beat synchronization. I then tried Egoist in BM3 but I can't seem to get it to work there either. The symptoms seem the same - it follows the current tempo, but never attempts to match the beat position. Relocating the transport position doesn't seem to step Egoist's current position to match - instead, Egoist's beat position just marches on using its own timeline. If anyone can demonstrate Egoist's beat sync working in BM3 (eg. with a demo project or steps to reproduce) then I'm happy to continue looking into it. I'm certainly not ruling out the possibility that it's still a problem with NanoStudio, but the current evidence seems to point to Egoist not doing the right thing. Are you all enabling External clock source and Host Start on the Egoist page? ‘Cuz I can’t get it to mess up at all on my Air 2 with those settings. So just to ensure that we're on the same page here, I'm saying that I can't seem to get Egoist's host clock sync to work and you're saying that I've got to enable Egoist's host clock sync like I'm some sort of hopeless noob who doesn't know his arse from his elbow and doesn't take the time or care to RTFM? OK, so now that I've enabled Egoist's external clock and host start modes as in the screenshot above (doh!) it seems to be working for me in the public release version of NanoStudio (ie. the version you're using). So can we put this down to operator error and close this thread down, or do people still feel there are issues with Egoist in NanoStudio? Nah! Definitely not operator error! 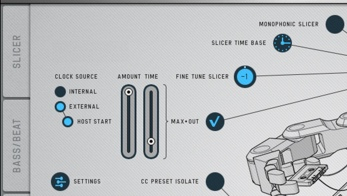 If “Clock Source” is set to 'Internal' Egoist won’t play/start via the host transport, it will only start by pressing it’s own play button. I see the issue you would have by starting Egoist separately (using internal). But try the original sight test, set to “External/Host Start”. Added: Now I see why you could not get it to work in BM3. I'm probably being stupid but isn't that how it's meant to work? I thought Egoist's 'Host Start' button would do that job. Dendy's also been trying this out on a slower device. He's found that the UI update can lag behind, but the actual audio's OK. Could that be what's going on there? Now that I've found out about Egoist's Clock Source buttons, its behaviour seems to be making sense to me. Yeah, when set to External, Egoist will start with Nano. I think maybe (don’t really like guessing) but SB's may have just left the option in the AUv3 because it’s (the option) is already there, so to speak. Users will still find a use for it.. Audio is definitely out! The visual test was only so everyone with Egoist could test, without any special song etc.. The audio drifting and becoming out of sync was what I noticed first. May have to do a short vid.. not today, but if needed? Never posted one before, but I’d just send a drop box link. 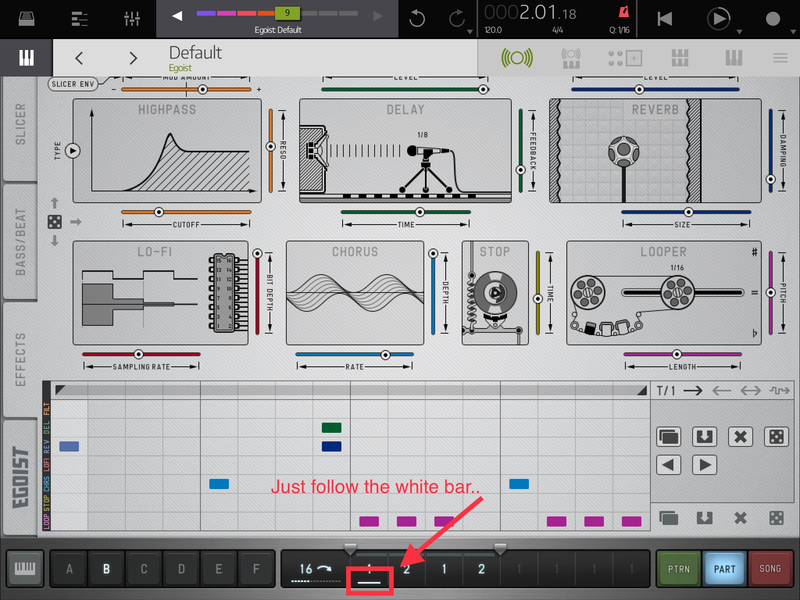 Listen to the kick stutter effect 1,2,3,4 (or 1,1,1,1) on “PART” 2 of Egoist Sequencer. Also don’t focus too much on the visual (running bar) in the vid, there was a screen recording lag, so that’s not too accurate, but still noticeable. It (Egoist or NS2) rectifies itself at 27 seconds into the video, I kept recording for awhile to see if it drifted again..
For a moment I thought it may have been the “Looper” FX settings, but again I just tried the exact same project in BM3, no issue. P.S: this quick test track sounds much better in stereo. Call me crazy, but I’m not hearing any issue...? Actually my faul was, that i was checking just visually those pattern numbers with line bellow at bottom of plugin UI (which King marked on first screenshot in this thread) - without listening actual sound. They are totally random unsynced all the time. "Drifting" like King named it. In all hosts, together with slicer playhead which jumps randomly . But the actual SOUND is perfectly in sync. It’s just that hyper-lagging UI which is completely “out of sync” on my Air 1, sound is OK. Same issue i see in that video - sound perfectly in sync, UI totally out of sync ..